1) News feed ads are better than side column ads. Why, you may ask? Facebook recently released some statistics showing that 78% of users are accessing their Facebook accounts via the mobile app on their phone. On Facebook mobile, there is no side column, which means that potentially 78% of your audience isn't even seeing your side column ad. News feed ads are front and center. Yes, your ad will eventually be pushed further down your audience's news feed but at least they exist. 2) It helps to offer something. Facebook is the only place in the world where it is not shameful to buy your friends. Everyone loves a sale, so advertise a promotion or an exclusive offer. Create some enticing bid which will bring people back to your company website to check out your products or services. 3) Use demographics targeting! Be a sniper, not a bazooka. Your ads will be much more effective if they are shown specifically to the people most likely to buy your product. Ads for bridal gowns will be more effective if shown to women between the ages of 20 and 40 who have just changed their relationship status to "engaged" than if they are shown to 20-40 year old men who just posted a link to the latest Trailer Park Boys movie. Make sense? 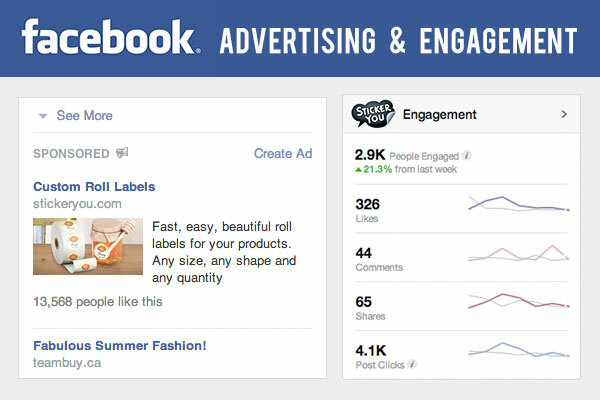 4) Unlike what you were told in high school, when it comes to Facebook ads, image IS everything. Facebook is a highly visual platform, so your ad should be at least 80% visual and 20% or less text. Your image should also be engaging and eye catching if it is going to stand out in the flood of other posts with a users' news feed. Use an image that makes sense for your target audience. If you're looking to target 20-40 year old brides-to-be, don't use an image of Chuck Norris, unless he is wearing a wedding gown. 5) Much like your underwear, Facebook ads should be changed about once a week. These don't have to be major changes, but small and frequent tweaks to the image, the text, and where the ads links to will make a big difference. Facebook ad manager recognizes these changes as fresh or new content. Fresh is good.